When Facebook released a live-video feature for Facebook at Work, Weber Shandwick was one of the first companies to put it to use. The service hasn't replaced the PR's firms other collaboration tools (yet), but it is quickly gaining traction. Facebook at Work has been in closed beta for the last 20 months, but the world's largest social network plans to officially push into enterprise later this year, and the company is adding features at a steady clip. Last month, for example, the team introduced group audio calling, a new call tab, a modular inbox for work chat that highlights frequent contacts and recent or unread conversations, search filters and live video. Weber Shandwick, a well-known public relations (PR) firm with offices in 78 cities in 34 countries, was one of the first organizations to start using Facebook's business product last year. Today, the company's entire workforce of roughly 4,000 employees uses Facebook at Work to collaborate, share tips with interested clients, and communicate in real time. When Facebook introduced live video to the platform last month, Weber Shandwick's CEO Andy Polansky was one of the first to use the feature for business communications. Live video on Facebook at Work may not completely replace other video options within the firm, but it's quickly becoming an integral part of the company's communications strategy, according to Michelle Giuda, the Weber Shandwick senior vice president of global communications. Giuda calls live video one of the most exciting features of the platform, and because live video on Facebook at Work requires few resources it makes video communication a much simpler proposition, she says. 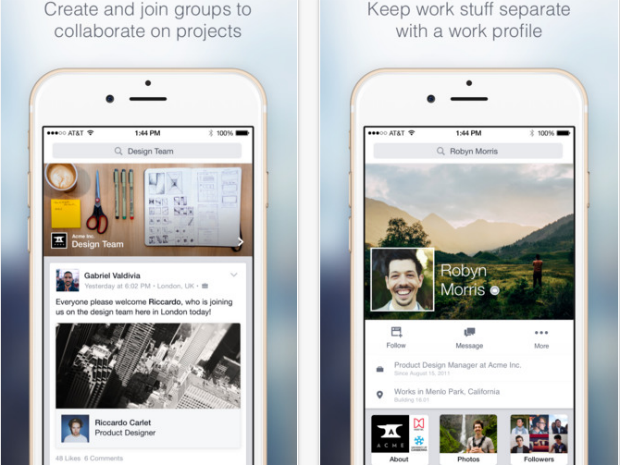 With its Facebook at Work service and mobile app, employees' work pages won't be connected with their personal pages and information won't be shared between them. Facebook at Work is a "place where people can come together and collaborate around different client projects, and in an easy way because people already know how to use Facebook," Giuda says. "Getting really early insights into best practices on the platform before it becomes publicly available" is also a huge benefit for the firm, because it gets more time to learn how to engage employees before its clients and rival PR firms gain access, according to Giuda. "As a consultancy we help advise clients on employee engagement," and Facebook at Work is one of many platforms the company explores for that purpose, she says. "This is the first one that we have deployed globally." Facebook at Work faces many competitors in the market for enterprise communication and collaboration tools, but the space isn't locked up, according to Brian Blau, research director at Gartner. "I don't think it's too late for Facebook," he says. The recent and rapid rise of Slack is a good example of how most businesses still aren't sold on a single communication or collaboration tool, Blau says. "Businesses haven't been keen to adopt and deploy social networking solutions for enterprise. There have certainly been attempts in the past, and while we see a certain level of participation in the enterprise, I think they struggle to get employees engaged on these platforms." Facebook at Work is one response to the ongoing evolution of business communications, and the changes aren't going to end anytime soon, Blau says. "These types of social communications are important and it's certainly how consumers are behaving online," but most businesses are not prepared for a new means of communication, he says. "You could say that the earlier efforts were too early — the Yammers and Jabbers." At Weber Shandwick, many employees are interested in and excited about for Facebook at Work, but the platform is still more of a supplement than a replacement for any other tool, according to Giuda. For example, the company still uses a separate intranet for company-wide document sharing, and some divisions use applications such as Slack for communication, she says. However, Giuda is encouraged by the "ease with which people are able to adopt and start using [Facebook at Work] because they are so familiar with Facebook," she says. "It is really intuitive, so that hump of getting over how to train and orient people on the platform is pretty low."